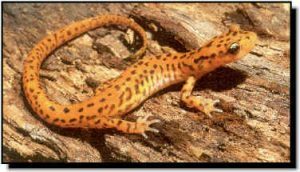 Comments: Inhabiting the twilight zone of limestone caves or nearby spring-fed streams, the striking orangeyellow cave salamander is a unique component of our Kansas natural heritage. This type of habitat is itself rare in Kansas. It is found in the cave at Schermerhorn Park in Cherokee County, either inside the cave or near the entrance under logs or rocks. The cave salamander is a good climber and uses its long, prehensile tail to help climb cave walls in search of invertebrates. It ranges from Virginia to Oklahoma and can be found in 12 states.